We tend to agree wholeheartedly with his assessment! If you get a chance to cruise in Ireland - particularly along the west and south coasts, whether on your own boat or on a charter, you’ll be rewarded with some of the most spectacular and unspoiled cruising grounds in the world. Cruising the coast of Ireland may not be everyone’s cup of tea, certainly not for those needing the creature comforts of marinas and their amenities. There simply are none along the west coast. An excellent resource for places to go and things to know along the west coast of Ireland is our book Cruising the Wild Atlantic Way. It is available on Amazon in both print and Kindle format. Whether by sea or by land, Cruising the Wild Atlantic Way provides visitors to the west of Ireland with information about what to know before they go and what they will find when they get there. 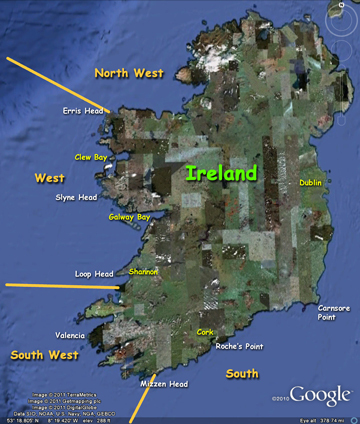 It provides a logical route with suggested stops in picturesque harbours, villages, and islands along the way from Donegal to Cork. 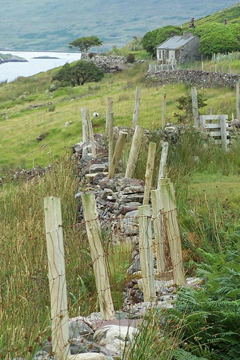 It encourages visitors to see the land as it was seen by explorers centuries ago along one of the most unspoiled stretches of coastline in Europe. 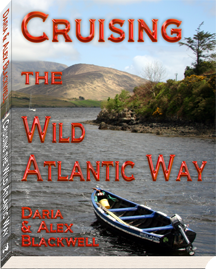 For more information about Cruising the Wild Atlantic Way, click on the Amazon links below, or visit our sister site, White Seahorse Publishing, where you can also view a short video about the book. Clew Bay - It is on this majestic bay that the O’Malley Clan, and more specifically, Grace O’Malley (Granuaille) the great Pirate Queen, ruled the seas and shores from their base on Clare Island. Weather wise April, May and June are often spectacular months. This region is heavily weather dependent as there is a lot of ocean off its coasts. The winds blow predominantly from the west making this west coast a lee shore and the weather can change unexpectedly. The coastal currents can also be strong, often developing a nasty chop. 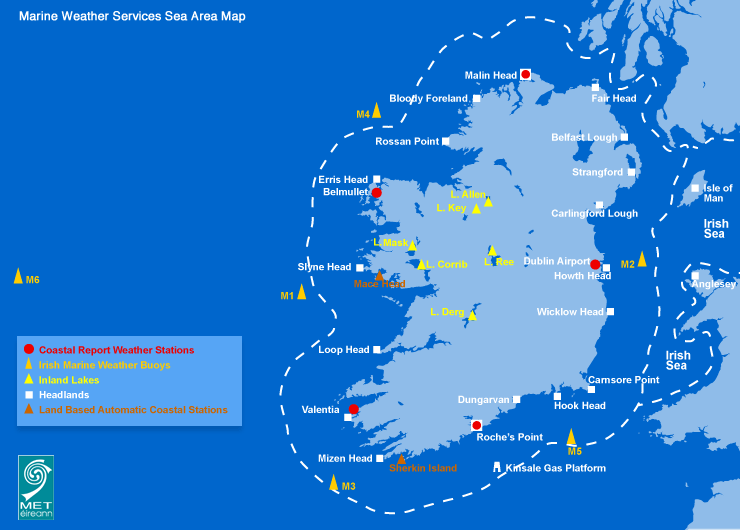 Like elsewhere, weather forecasting has improved over the years and the marine forecast issued by the met office is broadcast on the regional coast guard VHF stations. It is then repeated at intervals in its original form throughout the day unless a change is warranted. Charts for these regions are largely based on admiralty surveys from the 1800s. Updated paper and digital charts often simply have less data than the old originals. In addition, what you see on GPS chart plotter can often be quite different from reality. Navigational aids are limited, and are often not included on the chart. Unmarked rocks and shoals are abundant along this coastline. Careful navigation ‘the old way’ and experienced seamanship are required for safe passage. 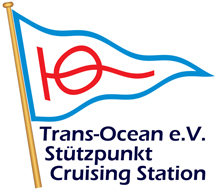 Covering the entire coast of Ireland, Cruising Ireland is intended as a companion to the well-known two-volume set of Sailing Directions issued by Irish Cruising Club Publications. 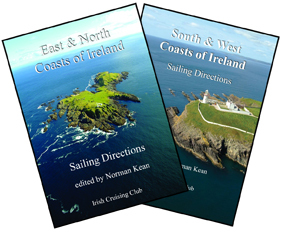 Written by Mike Balmforth and Norman Keane, editor of ICC’s Sailing Directions, Cruising Ireland covers the aspects that are not covered in the Sailing Directions, including the history, the folk lore, the geology, archaeological sites, wildlife and scenery. It notes what to look for and what to do ashore.